ABSTRACT It has been speculated that, in the near future, additive manufacturing will begin to have a marked effect on how we order and manufacture products. When one examines some of the implications of AM more closely, it can be concluded that it could, in fact, have a major Impact not just on products, but on our society, and how we live and do business. This paper briefly covers the state of the art in AM with a particular emphasis on where the technologies are heading, and then examines some of the issues that will need to be grappled with as additive manufacturing comes of age… within the next few decades… KEYWORDS: Additive Manufacturing, Future Focused Manufacturing Technologies. 1 INTRODUCTION In the late 18th century, the invention of the flying shuttle, the steam engine, and other machines that replaced manual labour produced almost unimaginable changes in society. They marked the start of the industrial revolution which influenced almost every aspect of daily life in some way. As the revolution progressed, society changed in every way. For the following two centuries average income and population exhibited unprecedented growth. The world's average per capita income increased over ten-fold, while the world's population grew by a factor of six. Never before had the world seen such unprecedented change. Additive manufacturing may represent the same paradigm shift to society, and will influence every aspect of the way we live. There has been a huge amount of research go into the many technical aspects of additive manufacturing, from materials and processes to applications and management. This paper speculates on some of the sociological and wider economic issues that additive manufacturing may give rise to. Additive manufacturing began in the late 1980s, with one of the most historically important patents being filed by Charles Hull in 1986, and the first commercial SLA machine appearing in 1988. Since then almost every year has seen an exponential rise in available systems, technologies and materials. The Society of Manufacturing Engineers defines Additive Manufacturing (AM) as the process of manufacturing a physical object through the layer-bylayer selective fusion, sintering or polymerization of a material . The additive manufacturing process begins by taking a 3D computer generated file and slicing it into thin slices (commonly ranging from a few microns to 0.25mm per slice). The additive manufacturing machine then builds the model one slice at a time, with each subsequent slice being built directly on the previous one. Additive manufacturing enables the creation of parts and products with complex features, which could not easily have been produced via subtractive or other traditional manufacturing processes. Injection molded or die-cast parts, for example, must be removable from the die in which they are made and must therefore be designed in such a way that this can be done. The metal part shown in figure 1, for example, could not easily be machined or cast because there is no way of removing the internal part of the die from the component or of machining the interior surfaces . Additive manufacturing, however, does not suffer from these particular restrictions. The complexity of the part does not affect whether it can be made, or even its cost. Figure 1: Fuel Injection Swirler from Morris Technologies. Tie-down clamp, with moving parts, made as a single integrated moving component on EOS SLS system. With additive manufacturing parts can be immediately made as there is no longer a long leadtime to get tooling produced. This has a great impact on new product time to market, and on the ability to easily produce model changes throughout the life of a product. It also has implications in stock control: As components can be made on the spot, companies may no longer need to hold stock of spare parts as they simply manufacture the parts when needed. From a product design perspective, it also means that every component made can be completely different to the others in a production run without significantly affecting the manufacturing cost. This opens the door to mass-customization in which, though massmanufactured, each product can be customized to each individual customer. For this new way of designing products to be used effectively the industry will need to develop new methods for integrating personalized customer data into their processes. This development has already started, particularly in the hearing aid  (figure 2) and the dental industries, in which specialized software exists to automate the processes of patient data acquisition. This now needs to be extended to encompass others, including consumer product industries. Figure 2: Individually customized mass-produced hearing aid shells. Because of traditional manufacturing technology restrictions a product, which the designer may have originally envisioned as having a certain aesthetic and functionality, may need to be compromised so that it can be cost-effectively made. Most designers are quite accustomed to hearing the response of “it cannot be made like that” from manufacturing engineers. They may then need to compromise their design to the extent that the product loses the essence that truly embodies the designers’ vision. 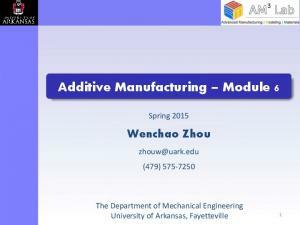 With additive manufacturing, complexity and geometry no longer affect manufacturability. Almost anything the designer imagines can be made precisely as the designer conceived it (figure 3). Figure 3: Quintrino lampshade by Bathsheba Grossman , Rollercoaster plate by Freedom of Creation (FOC) , and Subdivision bracelet by Nervous System . Nanoprinting aims at creating complete components and machines at a nano level. Prof. Satoshi Kawata, for example, is using technologies, such as femtosecond laser manufacturing, to build incredibly small components. This could herald the manufacture of nanobots that might be injected into the blood stream to clean the blood stream of all undesirable molecules. Research at the University of Southern California, is developing machines to print entire houses. The technology, called contour crafting, extrudes concrete through a nozzle and traces out the wall contours layer-by-layer until the walls are built. The current technology is already capable of building concrete walls in a laboratory situation. Research is on-going to develop the robotic systems to install modular plumbing and electric systems, insulation, window and door lintels, and so on. In parallel, Enrico Dini of D-Shape in Italy is developing a system based on 3D-Printing, in which a layer of stone powder is deposited, and a binder is printed onto the power, solidifying where it prints. The result is a large-scale structure made out of reconstituted stone. Estimates are that, once all the technologies have been developed, it will be possible to build an entire house within a few days. Tissue engineering, and the ultimate printing of entire organs or body parts, is an active area of research worldwide. Prof. Anthony Atala, of Wake Forrest University, for example, is currently able to bioprint a number of animal organs, and bladders for humans that are engineered out of the patients own stem cells. They have also used inkjet printing technology to print mouse heart valves, and are close to being able to print out a working human kidney. The Fluid Interfaces Group at MIT Media Lab has proposed concepts for 3D printers capable of printing food. In their concept canisters of raw ingredients are used to reconstitute the food requested by the user. Though this concept may seem like pure fantasy, active research is ongoing at research institutions around the world to make this a reality. THE FUTURE IMPACTS OF ADDITVE MANUFACTURING. Our current economic models, largely driven by the advent of factories through the 1st industrial revolution, are based around the mass production of products through a factory environment. In these models, products are manufactured in a factory that could be located anywhere, finished goods are then transported to retail stores (often via distribution centres) that hold a number of the products in stock, and the product is, eventually, bought by the customer. In these models, a large part of the cost of goods sold is not in the direct manufacturing of the products, but the indirect costs, such as transport, middle-man infrastructure and margins, etc. Though figures vary hugely depending on the type of product, it is estimated that the manufacturing cost of a product is typically between 10% to 25% of the retail price of the product. The rest goes into marketing, distribution and the various other costs currently required to bring the product to the consumer [10, 11]. In manufacturing, as AM technologies improve, and as material costs eventually get near those of traditional manufacturing methods, additive manufacturing could entirely replace traditional manufacturing, thus heralding true on-demand manufacturing, and a world in which product customisation is the norm rather than the exception. Not only will the manufacturing be on-demand, but it could well become ‘home manufacturing’ in which each of us has a 3D printing system at home which will supply is with whatever manufactured products we need. Your local garage will no longer need to have a store room full of spare parts, as they will simply print them as and when needed. Now extend this thought to our economic system as a whole. Imagine the whole new business systems this will create. Business models in which external manufacturing costs, labour, marketing and transport are no longer part of the equation. Instead, the value of products is in their design, and in the knowledge needed to design and use them. What would be the impact on the environment of not having to transport goods around the world? What happens to the traditional workforce? Do they shift into building AM machines, or servicing, or design? On the medical side, the gradual miniaturisation of AM processes will allow nano-machines to be printed that can patrol our blood-stream to keep diseases and viruses at bay, while advances in tissue engineering will allow us to print tailored replacement organs. Should we engineer ourselves a spare body to keep on ice, just in case? The impact of such advances, and the ethical questions they raise could be tremendous. Beyond the ethical questions, what about the increased leisure time that increased life-span is bound to cause? Even in food, one can imagine one day walking up to our refrigerator and ordering a cheese burger, medium rare, and the fridge printing the requested food for us out of raw materials, colouring and flavouring agents, and all the vitamins necessary to make it as healthy as it can be. Why not have it print out the cutlery and plate at the same time? Does this mean that conventional cooking now becomes something that is done purely as a leisure activity? And even within this question, are the ingredients used in leisure cooking grown the old-fashioned way, or are they simply printed? Though the exact timeline is hard to predict, it is foreseeable that additive manufacturing could, one day, replace conventional manufacturing techniques. If this happens, then it is also likely to have an effect on society, as it will change business models, health systems and lifestyles. Though much of this may seem like science fiction, a surprizing amount is already beginning to happen and the rate of development is accelerating. This paper presents some examples of where AM technologies are heading, and speculates on how some of the changes brought about by ever improving AM technologies might influence our futures. 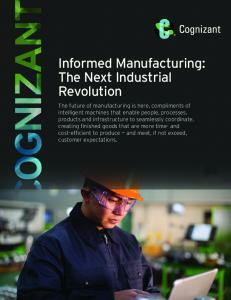 Report "Additive Manufacturing: The New Industrial Revolution"